OnSIP for iOS and OnSIP for Android are now available to all OnSIP users for free. Thanks to an outpouring of feedback from our early adopters, we're confident the OnSIP mobile app will be the most convenient mobile softphone option for your team. What Is the OnSIP Mobile App? Those of you who have installed mobile VoIP applications before will appreciate the first thing you see in OnSIP for iOS and OnSIP for Android: there's no configuration required. Getting started is as simple as logging in with your user address and password—no more entering server information, no more tweaking compatibility settings, no more troubleshooting headaches for you or your coworkers. Upon logging in, you'll have access to the standard dialpad, as well as your OnSIP contacts, your recent inbound and outbound calls, and your voicemail. You're now set up to make and receive calls on your business line from anywhere. When you're done for the day, just log out and your credentials will be saved for next time. You can also set the mobile app to "Do not Disturb" by switching on a toggle button in the Settings tab. A video icon tells you that person is logged into the OnSIP app and can receive video calls, while a handset icon tells you they are not using a video-enabled device. If either icon is orange, that person is currently busy with another call. 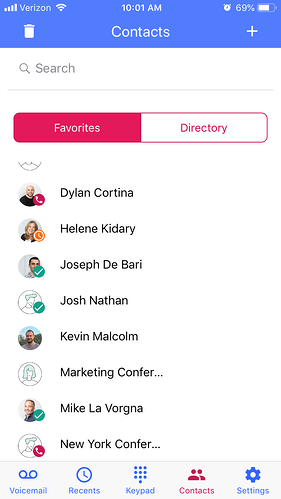 You can add custom contacts to your directory to make it easier to call clients or a coworker's cell number. It's also possible to call your iPhone contacts by opening the contact, long-pressing the phone icon, and selecting "OnSIP" as the method of calling them. Voicemail-to-Email attachments and a dial-in Voicemail Manager are better than nothing, but the Voicemail tab in OnSIP for iOS or OnSIP for Android should become the most popular option for voicemail on-the-go. All of your new and saved voicemail messages in one interface, with caller name, duration, and date information at a glance. Tap to listen, tap to call back, and tap to delete (including "delete all"). Try the OnSIP Mobile App & Tell Us What You Think!